Työskentelen Solteqilla robotiikka- ja tekoälytuotekehitykseen erikoistuneen Incubator-yksikön tiiminvetäjänä. Esimiestyön lisäksi työhöni kuuluu robotiikka- ja tekoälytarjoaman myyntityö sekä ratkaisujen päivittäiset kehitystehtävät. Minua motivoi työssäni valtava kiinnostus tekoälyyn, kovan luokan asiantuntijoiden johtaminen sekä asiakkaan arjen helpottaminen tekoälyn avulla. We are all familiar with the annoyance of time-consuming shopping trips, long queues and hit-and-miss selections. Store personnel, on the other hand, are held up by manual labour that takes their time away from customer service. Thanks to AI and robotics, these problems are fast becoming a thing of the past. AI and robotics play a key role in improving the customer experience in the retail sector. AI is already being used for targeting individual customer needs with tailored advertising of products on sale. Many of us have also breathed a sigh of relief when queuing has been replaced by convenient self-service checkouts. The manual labour required of personnel has also decreased thanks to automated product orders. The role of AI and robotics in retail is constantly growing, but a growing amount of data is also required. Robots and AI feed on data which, therefore, carries a key role in developing the customer experience. The more data a business has at its use, the better results can be achieved and conclusions drawn based on machine learning. Deep learning, machine vision and machine learning are bringing about a change unlike anything we have seen before. Now is the time to realign business activities with solutions of the future. Machine vision can be used to collect unlimited amounts of data in a store environment. Machine vision can already be used to count the number of customers in a store, group them by age and gender and direct individually tailored sale offers to them. Sales data can also be compared to product information on packaging: do bananas sell better on their own, or placed on the same shelf with strawberries? AI has the potential to revolutionise retail, as long as we remain open to this potential for improving customer service and making manual tasks more efficient. Automation allows employees to spend their time better and reduces the risk of human errors. What are retail stores like in the future? What will retail stores look like once the robots have had enough data to feed on? Upon entering a store, you will be greeted by a customer service robot, directing you to the correct shelf. You will be able to use your phone to view an augmented reality version of the store, complete with product names and locations conveniently visible on your phone. There will be no empty shelves or incorrect prices, as product information is updated in real time, and during the night, the robots will have set everything up. You will not need to queue even for the self-checkout, as your purchases will be charged directly to your credit card. 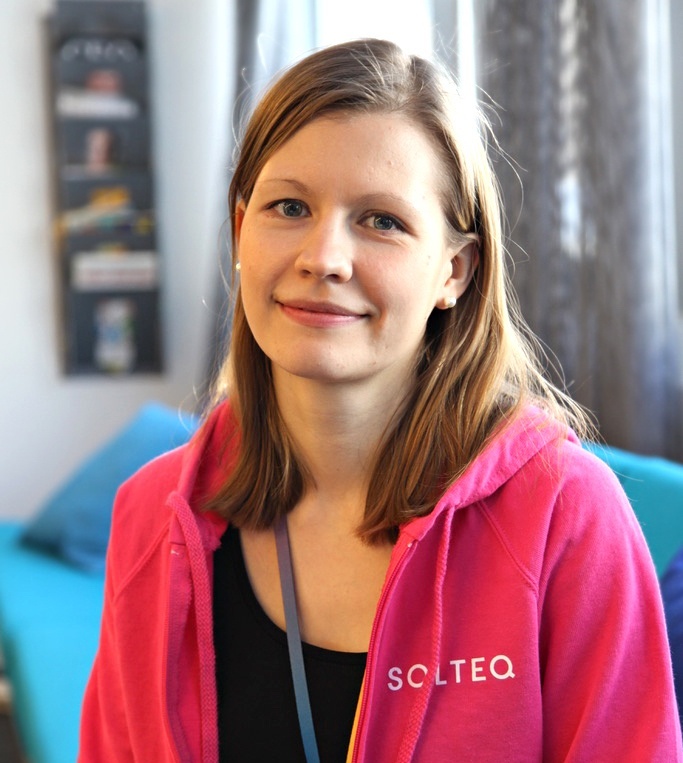 Here at Solteq, we have set out to support our clients’ business operations with focus on the following products: the Solteq Retail Robot that moves independently around a store, observing product information, customer service robot Pepper, self-checkout Solteq POS and machine vision and machine learning solution templates tailored to customer needs. The idea for this product family has come from the retail sector customers themselves, based on their needs. Interested to hear more? Get in touch!